The most instructive comparisons (whether of difference or similarity) are those that surprise. Yet already in the 1950s a reaction had set in. Indeed, the inventor of the term “meritocracy,” Michael Young, a leading Labour politician, coined it as a term of abuse (as a hybrid of Latin and Greek, it was technically a barbarism). He objected, as he later wrote, to the rise of a new elite class whose status was based on academic performance. Such a “new class” robbed the working classes of their natural leaders and, confident of its own merit and “insufferably smug,” it had little understanding and even less genuine concern for the masses, leaving them “morally naked,” judged to be without value. The new class, including both government and business elites, felt entitled to ever greater rewards for itself, which only made inequality worse, despite loud expressions of concern for the poor and oppressed. Since the 1960s, many voices on both left and right in the West have found fault with meritocracy. On the American left, the deepest concern is that the schools, universities, and tests that confer elite status are unfair to minorities, while the Right worries that progressive elites have become missionaries of an alien global culture, dedicated to wiping out loyalties to traditional morality and religious belief, to country, and to the wider Western heritage of freedom and tolerance. The recent political upheavals in Europe, Britain, and the United States, mislabeled “populist” or “Far-Right revolts” by elite opinion leaders, show on the contrary that hostility to corrupt, self-righteous elites is a mass phenomenon not confined to conservative think tanks or the political Right. Some large percentage of political moderates—moderate in their view of the state, the old marker of Left-Right sympathies—are rejecting the international progressive elite and all its works. Meritocracy may be in bad odor in the West, but, meanwhile, in China, it has increasingly been smelling like a rose, at least in the nostrils of philosophers and political scientists. In one sense this is not surprising, given that for nearly two millennia China was the world’s first and most successful meritocracy. Although supreme authority in imperial China, through its many dynasties, was based on the principle of hereditary succession, the magistrates and governors who ran the imperial government beneath the emperor qualified for their posts by a series of examinations on classical Confucian texts. Further promotion for the scholar-official depended on both learning and successful tenure of office. The system of imperial examinations was first introduced in the Sui Dynasty—a dynasty contemporaneous with the Merovingians of early medieval Gaul—and lasted, with various intermissions, revivals, and modifications, down to 1905, when it was suppressed in the final death agonies of the Qing Dynasty. By 1905 the examination system was seen as a relic of a failed political culture, one that had been unable to defend China against Western imperialists. Many Chinese critics of Confucianism at the time were themselves part of international networks who had acquired contempt for Chinese traditions thanks to their immersion in Western ideologies of modernity and progress. By the time the Republic of China was founded in 1911, the teaching of Confucian texts was dying out—though Confucian values proved to be more durable. When the Chinese Communists came to power in 1949, as radical modernizers they continued to treat Confucianism with contempt. In Mao’s various thought-reform campaigns during the 1950s and 1960s—the models for “political correctness” in American universities—Confucianism was regularly denounced as a relic of “feudalism.” The nadir came during the Cultural Revolution in 1966, when fanatical young Red Guards trashed the cemetery of Confucius in Qufu and laid siege to the nearby temple complex, the spiritual center of Confucianism. Since the reforms of Deng Xiaoping began in 1978, however, the ruling Communist Party has acknowledged that excesses were committed during the Cultural Revolution and that Confucianism should be considered a valuable part of China’s cultural heritage. Confucianism is taught in that spirit in schools and universities, and Confucian moral values have been publicly embraced by party leaders. Critics even complain that this “official” Confucianism has become something of a state religion, used to promote political quietism. The CPC seems at least to understand that, at this historical moment, Confucius has more appeal as a cultural icon than Mao. A thirty-one-foot-high bronze statue of the sage was even set up in a prominent place near Tiananmen Square in 2011, though it was removed four months later. Whatever the reason for its removal, Confucius remains useful as an ambassador of Chinese culture. The Confucius Institute, founded in 2004 by the PRC’s Ministry of Education, has established centers and programs all over the world, on the model of the British Council, the Alliance Française, or Italy’s Società Dante Alighieri, to teach Chinese language and promote Chinese culture. When China wants to present a benign face to the world of culture, its face is increasingly that of Confucius. Even more surprising is the emergence of the works of Confucius and other early Confucian thinkers as sources for the most interesting school of Chinese political theory today, known in English as “Political Confucianism.” The name is meant to distinguish it from the New Confucian movement of the early and mid-twentieth century, an effort of some scholars, first inside then (after 1949) outside China, to modernize Confucianism and bring it into harmony with Western rationalism. New Confucians saw Master Kong’s works as a wisdom literature, compatible with Western humanism and liberal democracy, primarily ethical in orientation. Political Confucianism sees in them a basis for a new, authentically Chinese political theory and for a reform of China’s constitution and forms of governance. (Other names for Political Confucianism are Constitutional or Institutional Confucianism.) Its political goal is, above all, to restore China’s traditional commitment to meritocracy. A good part of the impetus behind Political Confucianism can be described in Western terms as nationalistic, though it should be borne in mind that nationalism is a Western category not easily mapped onto Asia. It is sometimes said that China is a civilization masquerading as a nation-state, and this applies to Political Confucianism as well: Chinese scholars in the movement believe they are defending a wider Asian way of thinking and acting. In the 1990s Chinese thinkers felt themselves under renewed threat from Western imperialism, but this time the threat was more ideological than military or economic, and came from a growing embrace within China of Western-style liberal democracy and the discourse of human rights. The constant foil of Political Confucianism, even its bête noire, has been the famous work of Francis Fukuyama, The End of History and the Last Man (Free Press, 1992). Written in the immediate aftermath of the fall of Communism and the collapse of the Soviet Union, Fukuyama argued that the historical development of political institutions had now come to its end and that soon nation-states all over the world would be forced by the logic of history to embrace American-style liberal democracy. The book was a powerful irritant in Chinese intellectual circles, not only because it was written by a Japanese-American, but because it emerged from a late-Hegelian style of thought well understood in China and given credence by thinkers raised in the Marxist-Leninist tradition. In addition, the book came on the heels of the student uprising in Tiananmen Square (1989), which many inside and outside China believed was the harbinger of a democratic revolution and the end of the Communist Party’s hold on power. But the revolution hasn’t happened. Most Chinese turned out to have had quite enough of violent political upheaval in the Cultural Revolution, and most Chinese had, and still have, a measure of gratitude to the post-1979 regime for restoring social peace and presiding over the greatest and fastest period of economic growth in history. This above all is what explains the failure of Western-style democratic reforms in China and the consequent rise of Political Meritocracy. It would be easy to conclude (as many in fact do) that Political Meritocracy is an ideological weapon being deployed to defend the Communist system. But that is not only an injustice; it is close to being the opposite of the truth. To see why this is the case, it’s worth looking at the work of the first major theorist of the movement, Jiang Qing, whose writings have begun to be translated into English. (His name, as transliterated in the pinyin system, is, confusingly, the same as Mao Zedong’s fourth wife, one of the so-called Gang of Four.) Jiang Qing the philosopher, born in 1953, was the son of a high-ranking Communist official. He attended high school during the Cultural Revolution when, by his own account, he was a committed Marxist. Responding to Mao’s anti-elitist calls to “whole-heartedly serve the people,” Jiang enlisted in the army where he served as a truck repairman. His intellectual journey took him first from the industrial-grade Marxism of the CPC to the “humanistic” early Marx, and thence to the Western philosophers such as Locke and Rousseau with whom Marx was in dialogue. By this time he had left the army and enrolled in the Southwest University of Politics and Law in Chonqing. In his law school days Jiang became something of a radical, developing a form of liberal Marxism open to Western ideas of democracy and human rights. His writings were suppressed by the authorities. When his first thesis, “A Critique of Stalinism,” was rejected by his assessors, Jiang chose to move into what must have seemed safer waters, writing instead a thesis with the title, “A First Look at Confucius’ Humanism.” Without knowing it, Jiang had found the subject of his life’s work. Judged unreliable by the Party, Jiang was passed over for a government position and went through a period of disillusionment with politics. He experienced a spiritual crisis which led him to explore Daoism, Buddhism, and Christianity. He came close to converting to the latter faith but in the end, he said, “The spirit of Chinese culture dragged my legs back.” Eventually he committed himself to Confucianism under the influence especially of Tang Junyi, a New Confucian scholar in Hong Kong, and the brave Liang Shuming, the most influential Confucian surviving in mainland China. What provoked Jiang ultimately to reject New Confucianism were the upheavals of 1989. For him as for many others, the bloody repression of the student-led democracy movement shredded the legitimacy of the regime. But unlike others, Jiang no longer looked to the West for solutions to China’s crisis, but to the Chinese past, to the founding fathers of imperial China: Confucius and the early Confucian philosophers Xunzi, Mencius, and Dong Zhongshu. Jiang defined China’s crisis as a crisis of legitimacy, and legitimacy is perhaps the key concern of his work as a political theorist. Jiang rejects the modern principle, fundamental for both Marxism and liberal democracy, that the legitimacy of a regime depends exclusively on its claim to represent the will of the people. Marxists claim to represent the true will of the people, or what the will of the people should be by the lights of Marxist theory as interpreted by party intellectuals, whereas modern democratic leaders claim to represent the people’s will as expressed in popular elections. Jiang does not deny that the will of the people is one leg upholding the legitimacy of a regime, but it is not the only one, and not in itself sufficient to make a political system legitimate. In an early Confucian work called the Gongyang Commentary on the Spring and Summer Annals, dubiously attributed to Confucius himself, Jiang claims to have found three sources of legitimacy, those of Heaven, of Earth, and of Humanity. The legitimacy of Heaven refers to a sacred source of morality, something like the medieval Western idea of natural law, which has some kind of transcendent origin beyond the phenomenal world. The legitimacy of Earth comes from history and long-standing cultural norms, something like the Roman idea of the mos maiorum. The legitimacy of the human comes from the will of the people, which can (but need not) find expression through an electoral system. Jiang’s proposal for constitutional reform in China builds on this triple legitimacy by proposing a tricameral legislature: a House of the People, “chosen according to the norms and processes of Western democratic parliaments”; a House of Scholars, consisting of Confucian scholars chosen by cooptation and examination in the Confucian classics; and a House of the Nation, a largely hereditary body containing “descendants of great sages of the past, descendants of the rulers, descendants of famous people, of patriots, university professors of Chinese history, retired top officials, judges and diplomats, worthy people from society as well as representatives of Daoism, Buddhism, Islam, Tibetan Buddhism, and Christianity.” A body, in other words, not unlike the modern British House of Lords, meant to represent and preserve the most respected traditions and achievements of the Chinese people. Jiang also proposes a further, independent body—the Academy—which would set examinations for public office, adjudicate disputes between the Houses, prescribe state ceremonies (an important consideration for Confucians) and uphold religion, and generally act in ways similar to the old Roman office of censor, to maintain moral and intellectual standards among officials and parliamentarians. What Jiang proposes is neither Western-style liberal democracy nor a socialist republic run by the Communist Party, but something both new and old: a political system adapted to modern conditions but resting on a careful (though controversial) reading of ancient Confucian sources. Indeed, one of the remarkable features of Political Confucianism is its attention to the correct interpretation of texts, a mode of argument that recalls in some ways Western scholastic interpretations of Aristotle in the medieval and early modern periods. It matters what Confucius and his followers actually said, but the state of the texts and their often enigmatic quality leaves much open to interpretation. But some themes are clear enough, and one of those themes is meritocracy. Like the early Confucians, Jiang believes in government by the best and most humane (i.e., learned and moral) persons; in a government whose moral excellence is measured by its concern for all the people, including nonvoters such as future generations and foreigners. It is no surprise that Jiang ran into political obstacles to his teaching at the Shenzhen College of Administration and was obliged to resign his post. He now runs a privately funded Confucian academy in Guizhou, but his intellectual influence remains strong, and he is still a central reference point in the widening movement to return China to its meritocratic roots. Jiang’s bold proposals have acted like a lightning bolt at evening, suddenly illuminating the landscape of modern Chinese political thought. He has attracted numerous followers and critics, who are sometimes the same people. Perhaps his best-known critic in China is Joseph Chan, a professor of politics and public administration at the University of Hong Kong. Chan worries that Jiang’s constitution makes Confucianism into a “comprehensive doctrine,” structurally not unlike Maoism, that is inappropriate to rapidly changing, pluralistic modern societies. Its “perfectionism,” its insistence on a Confucian scale of values, would lead to social conflict and damage civility. In other words, it is illiberal. Chan believes that Confucianism should be invoked more selectively to promote certain values (like meritocracy) but should not be turned into a new state religion. Confucianism should be blended with liberal democratic institutions; those institutions should rest on a Confucian conception of the good, not on Western concepts of individual rights, radical equality, or popular sovereignty alien to Chinese civilization. Chan’s critique of Jiang in fact bears some resemblance to Locke’s critique of Hobbes’s recasting of Anglican Christianity as an ideological instrument of the state. Chan, like Locke, wants to limit the role of religion in public affairs, using it chiefly to identify a common good that transcends partisanship. Jiang replies that Chan’s defense of liberal pluralism shows that his deepest loyalties are to Western and not Chinese values; China should be allowed to form its own public philosophy based on its own traditions. Confucianism was historically able to tolerate Daoism, Buddhism, and Christianity as subaltern, private value systems under the umbrella of a public Confucian philosophy. Bai Tongdong of Fudan University is another Political Confucian who disagrees with Jiang on specific issues. A political philosopher educated in the United States, Bai writes engagingly in English as well as in Chinese. He has an excellent understanding of Western political thought that allows him to bring Confucius into dialogue with major Western thinkers from Plato to Rawls. Yet Bai, unlike Chan, does not aim to create a more inclusive framework for global politics via a synthesis of Western and Chinese elements; he is more a partisan defender of Chinese civilization and its political traditions against Western critics. His objections to Jiang are based on his own expert reading of Confucian texts. In Mencius, above all, he finds a more humanistic, less transcendental basis for Confucianism. Because of its relative secularism, this Confucianism is better adapted to the modern world. Mindful of the horrifying excesses of the Cultural Revolution, Bai argues that China needs to be wary of political ideologies that have the character of religious belief. The ability of religions to create deep bonds among citizens also makes them liable to intolerance of a kind that does not work well in large, pluralistic societies such as China. Confucianism should be understood not as a religion but as a Chinese political philosophy, neither more nor less. If ultimately it could replace the teaching of Western political theories such as Marxism-Leninism in China’s schools, Chinese civilization could be restored to its former autonomy and the long period of Western dominance in the Middle Kingdom brought to an end. Bai is representative of a newer strain of Political Confucianism that is more intellectually aggressive, willing to compare Chinese traditions with Western political values to the latter’s disadvantage. Bai goes so far as to argue that Europe’s political development from “warring states” in the early modern period to the modern European Union recapitulates in key respects the political development of China between the Spring and Autumn and Warring States (SAWS) period down to founding of the Qin dynasty (roughly 770 to 222 BC). Since Confucianism had its origins as a response to that long crisis of legitimacy, its complex modes of justifying elite power can offer philosophical resources to the modern European Union, often accused of lacking legitimacy owing to its “democratic deficit.” In Bai’s provocative formulation, China was “modern” before the West was modern. Even more challenging is the work of Daniel A. Bell, the leading ambassador of Political Confucianism in the Anglosphere and a major animateur of the movement within China itself. A Canadian educated at McGill and Oxford with near-native fluency in Chinese, he has made his career as a political scientist in China at Tsinghua and Shandong Universities and is a professor at China’s answer to the Rhodes Scholar program, Schwarzman College in Beijing. Bell’s controversial recent book, The China Model: Political Meritocracy and the Limits of Democracy (Princeton, 2015), makes the case for an alternative to Western liberal democracy, a new ideal of governance inspired by the Chinese Confucian tradition. Bell proposes confining democracy to local government, allowing experimentation with different political institutions at the regional level, but instituting a Confucian-style meritocracy at the top. Such changes would surely represent a considerable improvement over China’s current system. But that has not prevented his proposals from being widely attacked in the West for insufficient devotion to the principle of individual freedom, the basis for legitimacy in Western democratic societies. Bell’s critics rely too much, however, on the universalist assumptions behind Western theory: the idea that what is right for the West must be equally right for all societies. Despite appearances, Bell is not really asking which system, Chinese meritocracy or Western liberal democracy, produces better governance. That question can be argued in the world of theory, but a theoretical answer to an abstract question is not what is needed in the world of politics. Bell is really asking a more practical question: which system is more likely to provide a path to good governance in China as it seeks an alternative to the Marxist ideology that has less and less hold on the young, and even on members of the Party. As we see also in the West, the absence of a credible political ideal leaves only the hypocritical, the partisan, and the corrupt in charge of politics. Meritocracy is a case in point. In modern Western democratic thought, meritocracy will always have the suggestion of illegitimacy about it, since the principle of one-man, one-vote implies radical political equality. To deny that principle is to take away liberty as it is conceived in the West. Political equality has been a part of the American credo from its founding, and one way of reading the narrative of America, endorsed by Progressive historiography, is as a history of ever-widening equality, “fulfilling the promise of America,” in the cliché of media commentators. In fact the Founding Fathers of the American federal constitution tried to introduce a meritocratic element in the selection of the Senate, but the principle was discarded in the Seventeenth Amendment, passed in 1913 under the sponsorship of the early Progressive movement. In this way the challenge of the “China Model” spotlights a deep tension, perhaps a contradiction, in Progressive ideology: on the one hand, it defends radical equality, while on the other it proposes government by experts, or what Joseph Chan dismisses as mere “technical meritocracy.” In principle the technical meritocracy (or “managerial elite,” to use James Burnham’s term; “new class,” to use Irving Kristol’s; or “cognitive elite,” to use Charles Murray’s) is open to anyone of ability, but in practice it is difficult to prevent it developing into a closed caste with its own dogmas, interests, and culture, at odds with those of the non-elites it nominally serves. That is perhaps why modern progressive elites have developed ever more subtle theories of inequality, invisible to the naked eye, such as the theories of “microaggression” and “implicit” or “unconscious” racism or sexism. A highly visible extremism in the cause of eradicating inequality serves to draw attention away from the consolidation of elite power over non-elites—the oppression of the Benighted by the Enlightened (to use Thomas Sowell’s terms). As can be seen from the so-called populist reactions of the last year, the tactic has not worked, not least because people do not like being called racist because they are white, or sexist because they are male, any more than African Americans like being called inferior because they are black. In response, one is expected to engage in a form of self-criticism, recalling the practices of Mao’s Cultural Revolution. But progressive elites in the West still lack the fullness of institutional power enjoyed by the Communist Party in China; hence the temporary success of revolts against the elite in the Western world. Populism, however, can never be a governing philosophy for the simple reason that all government requires the rule of some over others, and all regimes need a degree of continuity if they are successfully to prosecute their policies. Hence there will always be an elite of some kind. If we accept the insight of the Italian sociologist Vilfredo Pareto, all elites will naturally seek to perpetuate themselves and rule in their own interest—all elites become oligarchies over time—unless institutions or social norms prevent them from doing so. The real question, as Plato and Aristotle already saw, is what kind of elites a polity is going to have, how to get good and wise rulers into power, how to make them rule in the interests of the whole and not the part, and how to prevent corruption. The more modern issue is how the good and the wise, assuming they can be brought to power, can have their authority accepted by those whom they govern. These are questions that have been relatively neglected in modern Western political theory after the time of John Stuart Mill, but they are front and center in Political Confucianism. One of the exciting things about reading modern Confucian political philosophy is the sense that it might actually have an impact beyond the world of theory. The Chinese crisis of legitimacy is still ongoing, and indeed is intensifying as the Chinese economy slows and the threat of recession looms. The CPC has relied a great deal on what Daniel Bell calls “performance legitimacy,” success in improving the quality of life for the people, yet economic inequality has continued to widen. Western lifestyles, if not Western democracy, have great appeal, and the tired scholastic Marxism mandated in universities is regarded by most students as an arbitrary set of dogmas one is required to parrot for the sake of professional advancement. It has lost its power to inspire. At the same time, China has become more nationalistic, in part to prop up the CPC’s authority, and more resistant to the imperialism of Western ideas. Pressure to do something about corrupt officials is building, a pressure to which the Chinese government has responded in Xi Jinping’s anti-corruption campaign. Ideological reform, perhaps even constitutional reform, may well occur in the near future, and as generation succeeds generation a modernized Confucianism could well displace Maoism as the governing philosophy of China, playing a role similar to that of Locke and Montesquieu in American constitutional thought. The outlook for similar changes in America is less favorable, as American elites increasingly owe their status to a decentralized system of wealthy private universities reliant on billionaire donors, especially Harvard, Yale, Princeton, and Stanford. They have become status-generating machines funded principally by private donations from powerful members of the elite. In other words, they provide a perfect illustration of Robert Michel’s “iron law of oligarchy,” the closed feedback loop by which elites protect their own power. Such schools have become political monocultures resistant to any challenges to their values or self-esteem. Perhaps the only way to imagine fundamental change occurring in the behavior of American elites, the only way to loosen their grip on power, is via wider changes in public opinion: a more skeptical attitude to elite credentials, for example. And indeed, in America, too, some cracks in the fortress of elite legitimacy have appeared. The commitment to “diversity” has been allowed to undermine the elite’s claims to merit, and it is increasingly hard to defend the injustice done to what is doubtless the fastest-growing and most meritorious of American ethnic groups, Asians. The default grade at many universities is now an A, and the consequent absence of meaningful assessment of student performance further undermines the elite’s claim to earned rather than ascribed status. Even more destructive of elite credibility are its conspicuous failures in the performance of the social sciences, especially in economics and health care policy, where both predictions and solutions have all too obviously fallen short of knowledge claims. Here is where Americans might well learn something from modern Confucian thinkers. The thrust of multicultural education has been to regard Western traditions and the political principles of the American founding with suspicion, if not contempt, but to treat all non-Western cultures with the utmost respect. So it’s possible that students might be brought to glimpse their own shortcomings in a more distant mirror—the Confucian mirror. Confucians, for example, have far more epistemic humility than their American counterparts. They are much more skeptical of ideological crusades aimed at bringing about political and economic equality or uniformity of thought; such campaigns, they recognize, inevitably lead to tyranny and the immiseration of the people, as occurred during the French Revolution or in Mao’s Cultural Revolution. Governments instead should attend to more modest ends, seeing to it that the people have the means to live a decent life and are protected from violence. “Asked about governing, the Master said, ‘Simply make sure there is sufficient food, sufficient armaments, and that you have the confidence of the people’” (Analects 12.7). Rulers that seek only their own enrichment will fail, but a ruler that aims first at justice for the people will have both wealth and the people’s good will (Mencius 1A1). Leadership status should spring from the natural admiration most people have for virtue and benevolence as well as from technical expertise. The problem with meritocracy doesn’t lie in the desire for status as such. The desire to excel others, to acquire the virtues (in the Aristotelian sense of that word), is natural but rare. In the proper circumstances, in the culture of the Confucian junzi or the English gentleman, for example, it can be admirable. It should not be repressed in a spirit of false egalitarianism but redirected in socially useful ways. “Instead of hopelessly and counterproductively trying to eliminate [inequality],” the natural desire for status should be turned “into something good—the service of the ‘small men,’ the disadvantaged,” writes Bai Tongdong. The Confucian idea is thus, for him, a kind of political version of John Rawls’s “difference principle,” according to which inequality should be tolerated if it serves the most disadvantaged in society. The ideal should be an “equality-based mobile hierarchy,” an elite open to all who prove themselves worthy. So if modern Confucian philosophers were to advise Americans concerned about the state of their elites, what advice might they give? I believe they would assign the highest priority to promoting a true meritocracy. The goal should be to select leaders and magistrates who (as Joseph Chan writes) “have integrity, ability, and commitment to public service and who will cultivate trust and harmony with the people.” To accomplish this, education, good culture, and strong institutions are all necessary, but education comes first. Given the hegemony of a few private universities within the American status system, if a competent, modest, decent, and public-spirited elite is to emerge, the donor class will need to appreciate that university programs and curricula as they are currently constituted, as a mere menu of consumer choices, have lost their orientation to the common good and stand in need of radical reform. Mere technocracy uninformed by humane values turns into arrogance and contempt for inferiors; policy elites who believe they have all the answers will train bureaucratic tyrants, wielding their little tridents, certain of their superiority to the ignorant rabble. Technical posts in government, involving economic policy or public health for example, of course need to be held by persons with the proper qualifications, but technicians should be guided by those with wider views and moral integrity. The highest officers of state should have an education that is broadly literary and philosophical, similar to older forms of classical education in the West or Confucian education in the East, and should include the study of history, languages, literature, and philosophy. And tenure of the highest offices of state must ultimately be justified not simply by successfully competing in examinations or displaying particular competencies but by proven success in improving the quality of life for all the people, and not just in material terms. Social harmony and respect for the sound traditions that have nurtured the finest achievements of America and the West require firm support from those set in authority over us. A society that turns its back on its past stands in danger of a foolish and destructive arrogance. As Master Kong said, “I was not someone who was born with knowledge. I simply love antiquity and diligently look there for knowledge” (Analects 7.20). 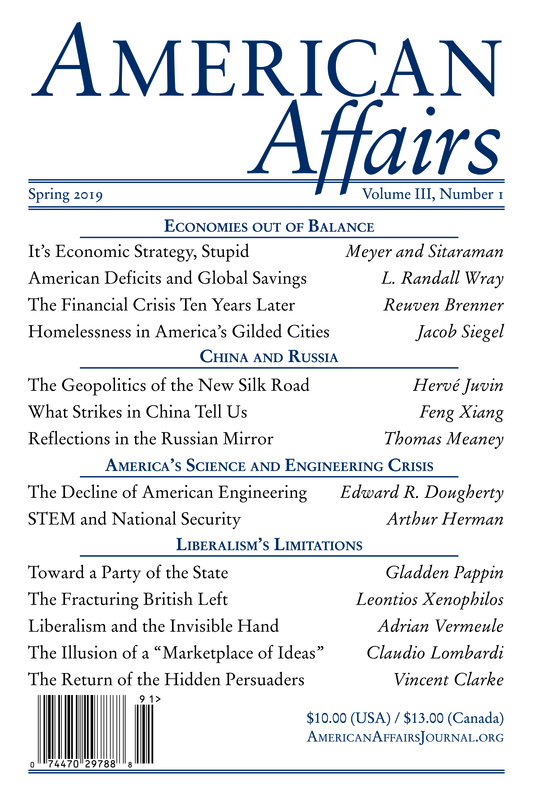 This article originally appeared in American Affairs Volume I, Number 2 (Summer 2017): 45–57.